Cast from real people, these toes are very realistic, and made from solid chocolate. Presented in a clear plastic grip seal bag like they use for police evidence. 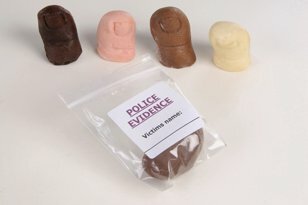 Each bag has a label that says "Police Evidence" with a space for you to hand write your 'victim' or guest name on.